We sell a complete range of snooker cues, cue cases and snooker accessories from the best known brands in snooker. As well as cues, cases and accessories for English pool, American Pool, English Billiards and other cue sports, we offer a selection of snooker and pool tables from small home tables to slate-bed coin-operated pool tables. Our prices are low and we offer fast free delivery on all orders within the British Mainland. The Peradon Mayfair blends traditional craftsmanship with distinctive modern design. Available to buy now. For those who insist on the best there's our range of Professional Packages. 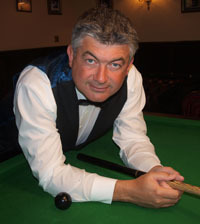 Exclusively available from John Parrott Cue Sports, our 10 piece Pro packages are our flagship product and are the ultimate in quality and value. Peradon's classic aluminium case is now available in black for the first time. I've been in the game for over 30 years. My aim is to give you the very best in products, prices and customer service. That's why we offer fast free delivery, a secure website and a no quibble returns policy.